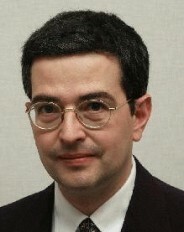 Alfredo Pasquarello was appointed Professor at EPFL in 2003. Currently, he leads the Chair of Atomic Scale Simulation. Within MARVEL phase I, he was the deputy director and project co-leader of Vertical Project 2. Since May 2018, he is a member of MARVEL Executive Committee. He is also a group leader in Design & Discovery Projects 3 and 4. Alfredo Pasquarello studied physics at the Scuola Normale Superiore of Pisa and at the University of Pisa, obtaining their respective degrees in 1986. He obtained a doctoral degree at the EPFL in 1991 with a thesis on Multiphoton Transitions in Solids. Then, he moved to Bell Laboratories at Murray Hill (New Jersey), where he carried out postdoctoral research on the magnetic properties of carbon fullerenes. In 1993, he joined the Institute for Numerical Research in the Physics of Materials (IRRMA), where his activity involved first-principles simulation methods. In 1998, he was awarded the EPFL Latsis Prize for his research work on disordered silica materials. Succeeding in grant programs of the Swiss National Science Foundation, he then set up his own research group at IRRMA. In July 2003, he was appointed Professor in Theoretical Condensed Matter Physics at EPFL. Currently, he leads the Chair of Atomic Scale Simulation. Quantum-ESPRESSO yield equivalent results [Miceli-2016]. To achieve a band gap in accord with experiment, we then developed a hybrid functional augmented by vdW interactions [Ambrosio-2016]. The redox levels in aqueous solution were studied through a combination of ab initio molecular dynamics and thermodynamic integration [Ambrosio-2015, Ambrosio-2016]. In particular, we considered the H+/H2 level that defines the standard hydrogen electrode and sets a reference for direct comparisons with experiment. The agreement with experiment is very good for both band edge levels and redox levels [Ambrosio-2015, Ambrosio-2016]. We then focused on the electronic properties of the hydrated electro (see Figure below) finding energy levels in very good agreement with experiment. 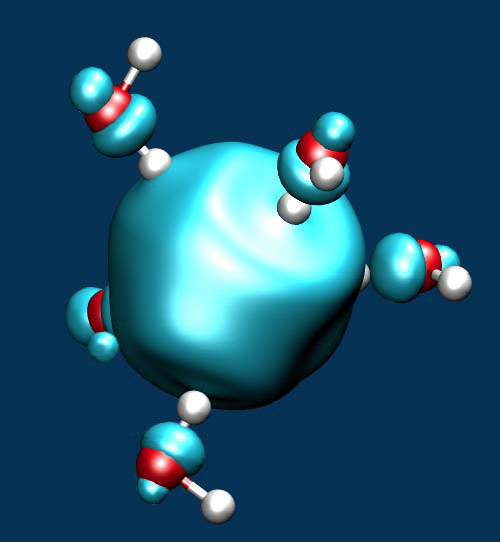 Isodensity of a fivefold coordinated hydrated electron. To address the degradation aspect in electrochemical cells, we focussed on the effects caused by OH– and O2 to the structure of amorphous Al2O3, a material which is often deposited on alpha-Fe2O3 to lower the overpotential of the water splitting reaction. Our results indicate that oxygen vacancies and interstitials do not occur in amorphous Al2O3 [Guo-2016]. However, holes can be trapped by the formation of a peroxy linkage [Guo-2016]. In interaction of the experimental group of C. Cancellieri (Empa). The extent of the defect state upon the removal of one neutral O atom from amorphous Al2O3 is illustrated (a) before and (b) after the molecular dynamics simulation.